A recent WSJ article regarding kids and credit cards piqued my interest and led me to think more about the role that parents play in shaping their child's view of money and finances. The old saying goes "the apple doesn't fall far from the tree" and in the world of financial learning, that is indeed correct. Much of what children learn about spending in their formative years comes via observation. If they observe their parents engaging in profligate spending, they are more apt to believe that is OK behavior because they have little understanding of cause and effect. After all, if they are still living in a comfortable home with nice clothes, food on the table and toys to enjoy, they will likely take that as a confirmation that their parents' spendthrift ways are rational behavior. Similarly, if a family carefully watches its budget while still providing the same nice clothes, food and toys in a household, a child will take this as confirmation that their parents' budget consciousness is important. Children are very impressionable. If they see you reaching for a credit card every time you go out to shop, they will begin to think that credit cards are an instant source of money (they are) but it's up to you to set the example and teach them that when the time comes for them to get a credit card, its balance should be paid off in full every month. This is a problem that confronts Gen Y parents in particular because we are gradually moving away from a monetary system based on physical dollar bills. Instead, the majority of consumers are more likely to use electronic payment methods such as a debit or credit card to pay for a store purchase. This has its pros and cons but there is one key thing I would recommend all parents do: before exploring credit cards with children, teach them about saving and spending the old fashioned way - with cash. There is much greater regret among children when the $10 bill they were given is spent than if it were simply accounted for via swiping a card. It may be old fashioned, but it certainly worked for me when I was a child! That can be a very good thing to do because of being a need of the era and also tanner mainstain helps me with many things that exists certainly. My name is Tim Olsen, I am 30 years old and have been in the workforce for four years after graduating with a bachelor's degree in Finance from LSU. 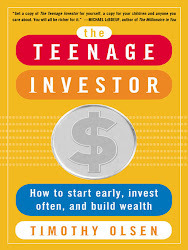 I also have an MBA from Loyola University New Orleans, and am the author of The Teenage Investor: How to Start Early, Invest Often and Build Wealth which was published when I was 13. Now, as a Gen Y investor advocate, my goal is to turn Generation Y investors into Generation WI$E investors. Timothy Olsen 2016. Simple theme. Powered by Blogger.